Oui! Oui! We Can Dukan! Mix it all together into a bowl until there are no Quark-y lumps. Pour into a hot omelette pan sprayed with a bit of butter flavored cooking spray (like PAM). Let it cook just like a pancake turning over after a couple of minutes. It should be a nice “pancake-looking” golden brown on both sides. 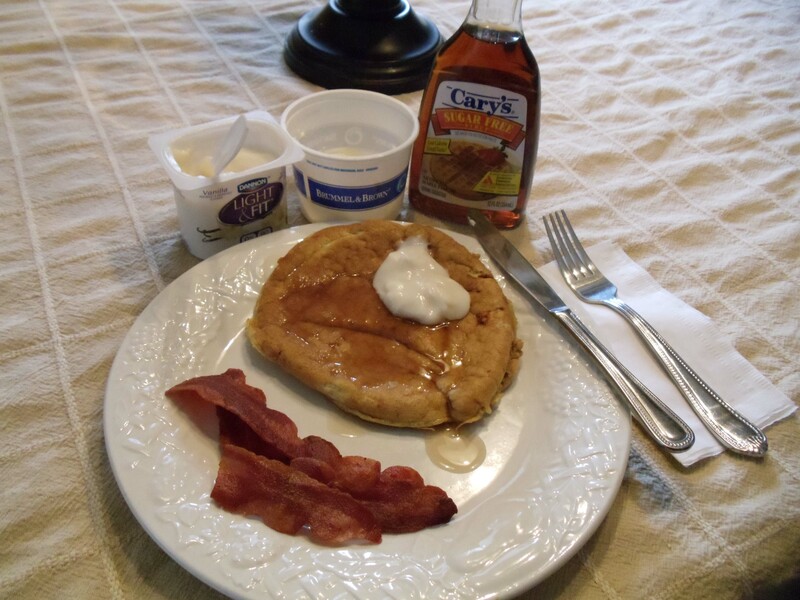 Serve with your favorite Sugarfree Pancake Syrup. For an extra treat, spoon some nonfat flavored yogurt on top. I also used about 1/2 tsp. Brummel & Brown margarine. My husband and I both had a side of turkey bacon cooked really crispy. It was heavenly! Starting this week…I’m posting weekly in 2011. Let’s see how I do with THIS New Year’s Resolution. Truthfully, I’m more excited about finally going over the 1/2 way mark in my weight loss goal. I can see the finish line. Every day, I go into my closet and find something in there that I haven’t been able to wear in a LONG time. Then when I put it on, I find out it is BAGGY. I’m really going to have to do a closet makeover this weekend. I may have quit blogging for a while but the GOOD news is…I did not stop dieting. In fact, I’ve barely every cheated and if I do have something that is considered a “no-no” on the “oui-oui” diet, it was just an itty bitty bite. During Thanksgiving, Christmas and New Years, I did have a couple of glasses of my favorite red wine. The day after Thanksgiving I had actually lost weight (over 1/2 lb.) The day after Christmas I had gained a pound and a half but it fell off quickly. The day after New Years, I was down two-tenths of a pound. I’m proud to say that this morning I reached another milestone…under 140 lbs. I was thrilled. I have been tracking my progress on a spreadsheet and weighing every day. I started out losing about 2 lbs a week. I realized after about 8 weeks that my weight loss was slowing. I now lose about 1 and a 1/2 lbs per week…and really, that is nothing to complain about. With my adjusted 1 and a half pound per week progress, I should be at my goal weight around the first week of June. Just in time to actually be able go to a place where I can wear a bathing suit. It will be fabulous. Starting today I’m posting every day in 2011! I’m down another lb…(.8 lbs) since Monday. Close enough. I’m really happy that my Dukan Diet Book came in the mail yesterday. I finished reading up to the recipes so I’ll be trying out a lot of new recipes very soon. My daughter has started the diet this week also. She has only a little weight to lose so her attack phase was only 3 days long not 6 like mine. She loved the Oat Bran cookies so perhaps I’ll post that recipe the way it is. Of course, she was feeling a little weak from her dieting at the time she ate them. It’s quite possible she would have raved about eating cardboard. Well, I will be posting those recipes tomorrow. See you then! …today, I had a wonderfully big breakfast on my PP Cruise day. Turkey Sausage, 3 Eggs (1 Yolk) scrambled with a NF Sharp Cheese slice and some chopped Canadian Bacon. I forgot about lunch, however. I was just too busy at work. So, now it is dinner time. I plan to have some NF Cottage Cheese and some leftover Roast Beef I cooked last night. Yesterday, I tried a recipe for OatBran Cookies. They were AWFUL! I’m going to change up the recipe and post it here if I can improve them any. People Who CAN DO Dukan! !